Are you sentimental and value traditions? Are you a bride who loves a vintage wedding dress and wants to capture the romance and beauty of an earlier age? Well you are in luck. As you begin your search for that perfect vintage wedding dress, educate yourself so you will not become a victim. Believe it or not there are actually people who might try to cheat you. Know what you want and how much you are willing to spend. Remember to shop around. Ask questions. If it doesn’t feel right, it’s O.K. to walk away. Beware of online vintage shops without written details about a dress. Or indicate the gown is in mint condition, but may list many things wrong with it. Buying a vintage wedding dress isn’t as scary as it sounds if you have educated yourself and use the following tips below. How much do I want to spend? Knowing your budget will help you from falling into the trap of falling in love with the unattainable. Know what style you’re looking for. Look for styles that flatter your figure or show off your own personality. If you find a vintage wedding dress you like, but don’t love, consider removing the sleeves or shortening it. Take up the hem line or change the neckline. Don’t be afraid to modify a vintage wedding gown to make it your own. Check family attics first. You might want to check with your mother, grandmother, and relatives or close friend. Many women treasure their wedding gowns and have preserved them just for this purpose. Don’t be afraid to ask around. Know the condition of the dress before buying or borrowing Depending on the age of the gown it could be too fragile to wear. Check the stress points of the gown. These are under the arms, shoulder seams, zippers, waist line seams, and buttons. Avoid buying gowns with stains. Beware of buying a gown with stains. It could cost you a lot to have them removed and could change the appearance of the gown. Delicately try on the dress. Vintage gowns need to be treated with great care. Vintage wedding dress sizes are not the same as today. You will want to be careful not to damage the dress while trying it on. 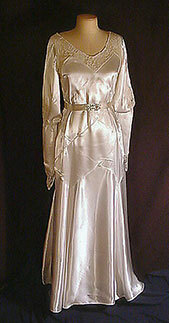 Vintage dresses seem to run in smaller sizes mainly because brides were married at a younger age. If you are a larger bride you might want to consider having a replica of your favorite vintage wedding gown custom made. Make a list of all the questions you would want to ask the seller and ask them. Any reputable seller will not mind. Make sure the seller offers a written description of the dress if you find it on-line. Pictures alone cannot give enough description about a dress. As an added touch, you might want to display a picture of the original bride along with your own bridal picture. If your vintage wedding dress needs restoration, our restoration experts can be of great service to you. Get a Free Estimate for our restoration services. Someday your daughter may want to wear your wedding gown again, so don’t forget to preserve it after your wedding. Cleaning and preserving your vintage gown as soon as possible ensures that your gown remains in the best condition possible. A reputable wedding gown preservation specialist will know how to get your beautiful gown clean and restore it to its original condition as much as possible – without inadvertently doing damage to your precious gown in the process. 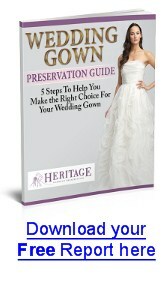 Let Heritage Garment Preservation clean and preserve your vintage wedding gown for you. Our expert staff will give it the tender loving care it needs. Can’t find that perfect vintage wedding dress, consider lace wedding dress. Lace always feels vintage! © Copyright 2014 Heritage Garment Preservation as long as you include the copyright notice above and a link to our website.